I’ve been backpacking for over 30 years now and walked half of the Pennine Way when I was just 15 years old. I have since walked many of England’s long distance trails as well as hiked in Europe over the years, but have done little backpacking in Scotland. I am now looking for more challenging routes and the Cape Wrath Trail is renowned as one of the wildest and most remote walks in the UK – it’s certainly one of the most challenging! I have wanted to hike this trail since 2010, but various things conspired against me – including me simply ‘putting it off’. However, last year I heard rumours of the military attempting to buy the area around and including Cape Wrath and this saddened me. The military already own vast areas in the north west of Scotland and I know that, at certain times, these areas are closed to the public which flies in the face of Scotland’s wonderful land access policies. So I decided that this was the year I would put aside excuses and go for it – after all, if the military get their way then access to this iconic area might be restricted, or, at worst, lost! Then something happened that not only galvanized my resolve, but also gave me the opportunity to help protect Cape Wrath. I am a large user of Social Media and Networking sites where I promote myself and share ideas and experiences with like minded people and recently I was followed on one of these sites, Twitter, by @GoCapeside. When I looked at the profile of this this new follower I saw that it was the Twitter account for the Durness Development Group Ltd, the community charity for Durness. Durness Development Group Ltd, the community charity for Durness, are trying to purchase the 45 hectares of land surrounding the lighthouse at Cape Wrath. Ensure continued public access this is a public space. It is the end of the Cape Wrath Trail, The Scottish National Trail and part of the International Appalachian Trail. Community ownership will enshrine the right of public access. Improve the visitor experience through sympathetic development of the facilities, Cape Wrath attracts thousands of visitors a year from all over the world and by all means of access, some come by minibus, some cycle and increasingly more walk in. However, there are very little facilities to cope with the numbers of visitors and one of the first things that the community would like to undertake is the installation of some public toilets. Undertake essential repairs and maintenance of this historic site from the dry stone dykes to the Lloyds buildings to the old stables, the site at Cape Wrath is in a worryingly poor state of repair. The community intends to raise the monies to maintain and restore these historic buildings and landscape features. 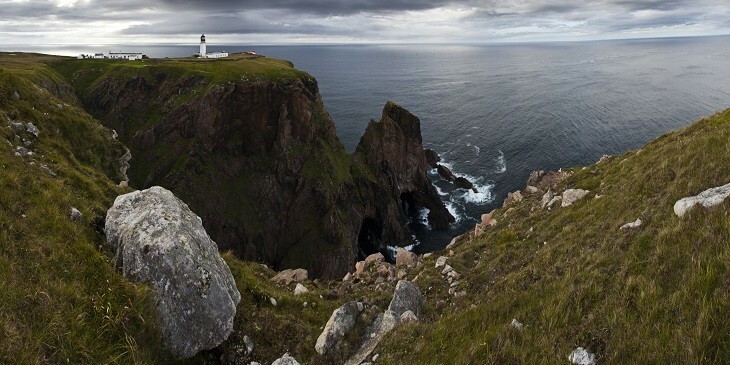 Cape Wrath is a wonderful destination, it is remote and wild and a place that truly captures the imagination of the more intrepid individual, the community wishes to ensure that visitors can enjoy this wild and rugged landscape for many years to come. On behalf of the communities of Durness and Kinlochbervie we would like to thank you for supporting this extremely worthwhile cause. This seemed such a worthwhile endeavour, and one that will resonate with many walkers, hikers, cyclists and other people who like to roam the land, that I’ve decided to dedicate my Cape Wrath Trail backpacking adventure to this worthy cause. I will be setting off on the Cape Wrath Trail around the 13th April this year (2016) to hopefully help raise funds for the Cape Wrath Buyout Charity and humbly ask if you, my friends and followers, could help save Cape Wrath for future adventurers and donate a little money to the Durness Development Group by clicking the image below. I thank you all in advance and hopefully, together, we can do our small part in keeping Cape Wrath in community hands for future folks to enjoy and put a stop to the military getting their hands on this beautiful part of, not only Scotland, but of the UK! You can follow my progress once I start hiking the Cape Wrath Trail via Social Hiking – ShareYourAdventure.com and I will be writing further blog post about my hike including, believe it or not, a kit list! I know – who would have thought that I would ever write a kit list 🙂 I will edit this post to add links to subsequent Cape Wrath related posts as I write them so stay tuned folks . ...on Hiking, My Adventures backpacking, Cape Wrath, Cape Wrath Trail, Charity, Durness, Hiking. permalink. Hi Chris. Pray for reasonable weather for me! I haven’t forgotten – just time/work restraints mean working out the logistics. However, I will endeavour to hike the Millennium Way Sept/Oct time this year.